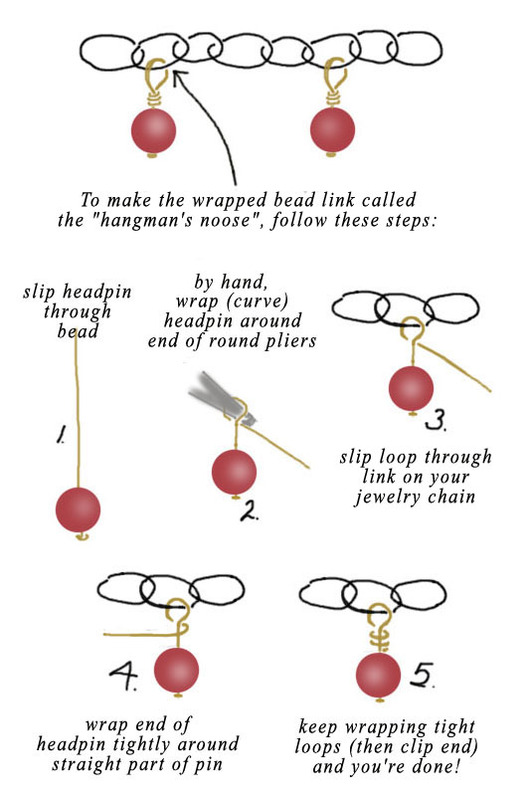 This is something I take for granted – I use (and wear) a lot of ball chains, the simple chains that are used in the military to hold dog tags – and out in the jewelry world, to also hold dog tag pendants. Plus a lot of other necklaces and pendants. They’re easy to open and close – once you know how. But if you aren’t used to them, they’re probably maddening! They don’t have a typical clasp. Instead, they have a connector as shown in the sketch below. I think that shows it pretty well – basically, you find the little connector, hold it securely with your thumb and forefinger – and with the other hand, snap the little round balls out of the connector. 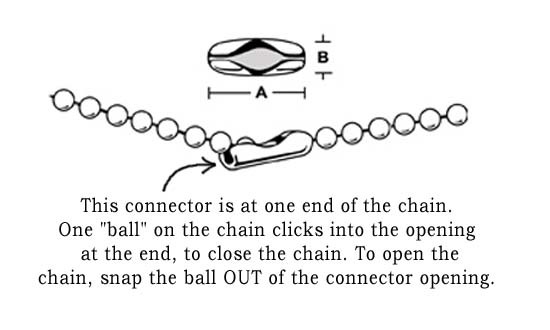 Or slip the little ball back into the slot, to re-connect the chain. it’s easy – once you get used to it. And if it’s still difficult, drop me a note – we’ll figure it out! But really. Would you like directions? Okay, here goes. Scrub your potato, just in case there’s dirt on there that’ll wash off. Then poke it with a knife. This part’s important – there’s enough liquid in the potato that it could kind of explode if the heat builds up enough while it’s cooking. Very messy. Anyway, you washed your potato and poked a couple holes in it. Then put it in your microwave, set the timer for 6 or 8 minutes, depending on how strong your microwave, how big the potato, and the phase of the moon (yes, I’m kidding about the moon part). Hit START. When the timer goes off, grab a potholder because this potato’s going to be hot. See if it’s kind of squishy when you push at it. If it’s still hard(ish), give it a couple more minutes. If it’s soft, it’s done. Honestly, if there’s more we need to know, I will revisit this post. If not, treat “how to microwave a potato” in the same vein as “how to boil water”. Just a quick note here – I did a comparison to see what the Curves function in photoshop would do for a “quick fix” on a photo. Brian, thanks for letting me play with this! How to freeze green beans – without blanching! Talk about a useful Tip of the Day ! I just got a lovely big supply of garden fresh green beans from a dear friend (somehow my garden didn’t happen this year). I was getting ready to blanch most of them, because much as we love green beans we can’t eat them all up in a few days. Then I had an attack of brains and thought, I ought to doublecheck the best method – you know that’s one of the reasons we love the web. And I found this most wonderful article on how to freeze fresh green beans, without having to blanch them first. I am trying this TODAY. A huge thank you to Jami, of An Oregon Cottage, who kindly gave permission to share her idea with a link to her blog. She has some wonderful advice – and project articles there – you are going to have so much fun! PS! Edited (days later) to add this: the beans turned out to be very tasty. I did need to spend a little longer cooking them (they were chewier than usual) – but they really were good. And easy to prepare: I tried two different ways. First time, I steamed them for several minutes. Second time, I microwaved them with just a smidge of butter, for about 2-3 minutes. Both methods worked. Save yourself time – freeze those wonderful fresh green beans! My main jewelry supplies store is Weekendjewelry1 on Etsy. Like many Etsy sellers, I’ve been struggling a bit to figure out how to rearrange my shop items in the new mobile-friendly layout. 2. Go to the bottom of your first 24 items and click on “More Items”. Repeat as needed, till they’re all available in one long page. 3. Now go back to the top and click on “REARRANGE”. 4. A number will appear in the upper right corner of every listing. Find the listing you want to move to your No. 1 slot – and type 1. 5. Hit Enter. Presto – your fisrt item is now in your Number 1 slot. 6. Repeat with your Number 2 choice. And Number 3, and etc. 7. View Shop when you’ve moved all the items you want to. This may sound like something you’ll hardly ever do – but if you end up buying stones and settings separately (rather than having the stones pre-set before you buy them) it’s handy to learn these little tips. 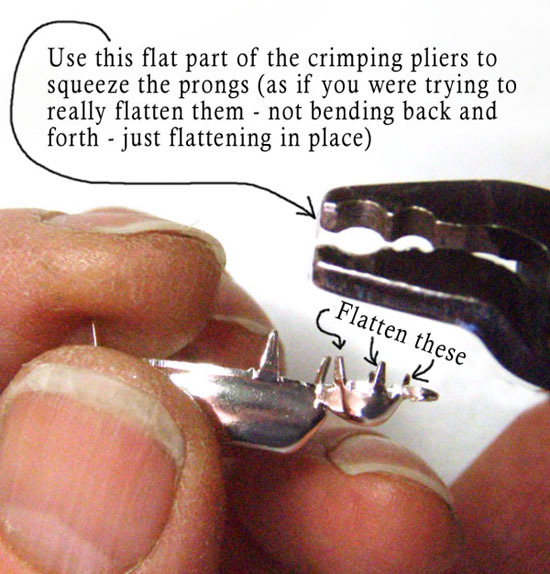 Your crimpiing pliers are really helpful here. In many settings, the tiny stone is 20ss (or “stone size”) – and 20ss is about 4.5mm. I did a little sketch to give a few helpful tips when setting them. 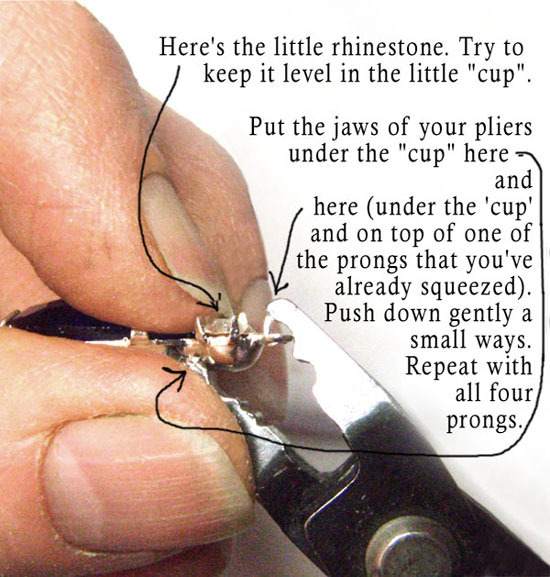 One of the most important things to remember, after you squeeze (flatten) the little prongs, is to close them *slightly* over the stone. Don’t try to flatten them all the way down to the glass – you’ll chip something. 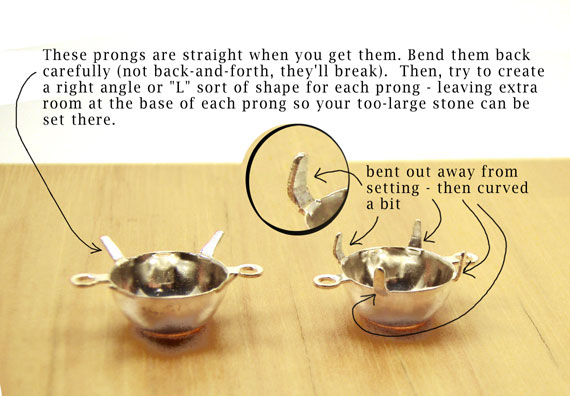 With all the prongs gently leaning toward the “closed” position, your stone will be protected and secure. It won’t work if your stone is way too big. 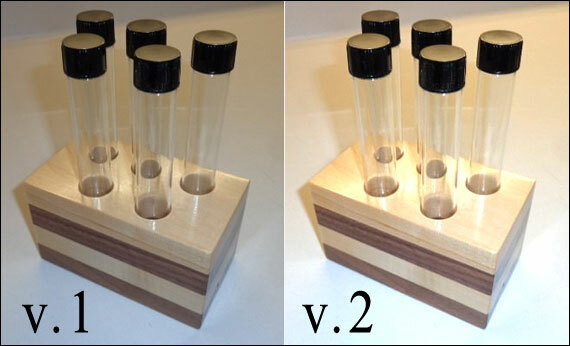 But a millimeter or so (and that’s a LOT, with calibrated stones) – you can make it work. I’ll do more pics soon – i.e., what if your stone is too *small*? I recently found a simple, easy to follow post about doing your own product photography. It’s cheap, it’s easy to understand – not only what she does but WHY she does it – and the tips really do help! I found it over at Apartment Therapy which you know I think is pretty wonderful anyway.